On the lacrosse field, timing is everything. No one knows that better than former Syracuse goalie Dom Madonna ’18. In 2017, Madonna and his lacrosse teammates Ben Williams ’17 and Joe DeMarco ’17 saw a need for a solo training device for one of the most important positions in the game, faceoff specialist. Madonna, a mechanical engineering major in the College of Engineering and Computer Science, started working on different designs. He was challenged by the fact that a device would have to be able to mimic the angle of an opponent’s stick and wrist movement with different levels of resistance. 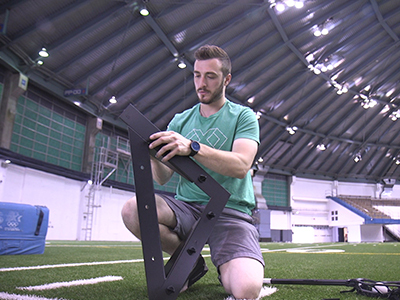 Madonna and his partners needed to find a way to make a device strong enough for a Division 1 lacrosse player to push against—but be lightweight enough for it to be portable. Lacrosse cleats gave Madonna the inspiration for a solution. Madonna, Williams and DeMarco named their company X-Factor Lacrosse. They won the 2017 Syracuse University Panaschi Business plan competition just two days before Syracuse’s first-round NCAA tournament game against Yale. “We ended up winning that, then we won the game so it was a great weekend for us,” says Madonna. Madonna was a full time engineering student, playing Division 1 lacrosse and building a startup business He also worked on the patent application in his free time. Their hard work is paying off. Colleges and high school lacrosse programs are already using the X-Factor Real-Rep Pro Faceoff Trainer and they can be purchased on Lax.com.